Today's dose of Halloween Fabulosity is dished out with Gothic Style courtesy of an imagined meeting between Morticia and Mrs. Havisham. This is part one and part two will be served on Thursday. 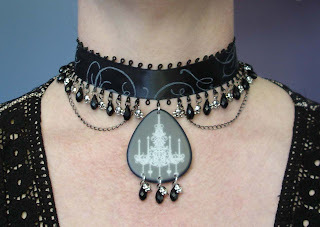 Follow this link for instructions to make the Morticia Invites Mrs. Havisham to Tea Choker. I don't think these pendants are out there anymore, but it should be fairly simple to whip up a little mixed media pendant to go with using some clear acrylic tiles and decoupage medium.